Ringo gives you complete control over your ordinary apartment buzzer, allowing you to add the ability to use access codes and forward to as many mobile phones as you need. Ringo ensures you’ll never be locked out again. You can control who has access to your home from anywhere in the world and receive notifications when they arrive. Our security systems rely on the same encryption protocols used in online banking so your information and access codes are always secure. Sign up with Ringo in four easy steps. No hardware required. Grant access from anywhere in the world. Ringo requires absolutely no hardware and works with your apartment intercom. If your current system is able to call to a landline or mobile phone Ringo will work for you. You control who has access to your building. If you need to let in your housekeeper, your family or your guests on Airbnb but aren’t sure you’ll be available, Ringo has you covered. Ringo offers call forwarding for up to five additional phones. That means you and all of your roommates have control over the front door. Ringo is free to try for 30 days with monthly billing after that. Ringo is a service that gives you control over your ordinary apartment intercom or buzzer system by adding access codes and the ability to connect multiple phones. Once you’ve signed up for an account, we’ll give you a phone number (Ringo Number) you can give to your building manager to use with the intercom system. Now when someone uses your apartment’s intercom, they’ll be asked for an access code. If they don’t have one, Ringo will automatically ring through to any phones connected to the account. Ringo is free to try for your first 30 days. After that, it’s only $5.99/month for Ringo or $3.99/month for Ringo Lite. Ringo Pro is priced at $18.99/month. You can cancel at any time during or after your free trial, no questions asked. Ringo is available wherever you are in North America. Is Ringo compatible with my apartment? If your building’s intercom system is able to dial out to a cell phone or landline, Ringo will work for you. The system works entirely with your current apartment buzzer and requires no hardware at all. 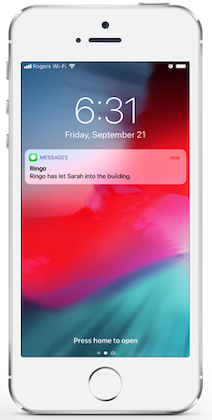 Ringo will notify you by SMS anytime someone enters (or attempts to enter) your building. Ringo relies on the same encryption protocols used in online banking so your information and access codes are always secure. 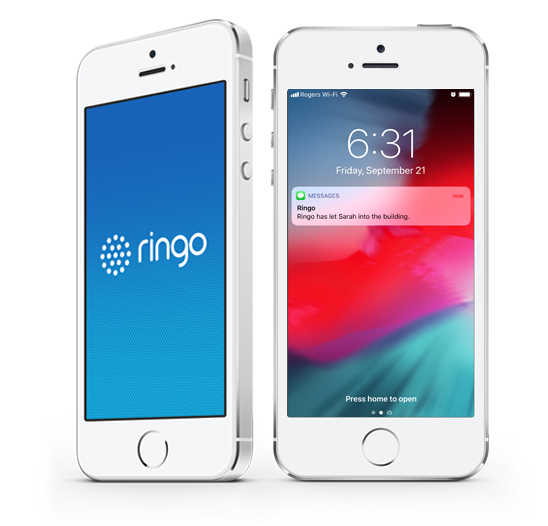 Ringo uses providers with incredible up-time records and has built in redundancies that will keep your Ringo system working in the unlikely event that one of our providers is down for any period of time. Ringo’s service has never once gone down for any of our customers. When will Ringo be available internationally? We plan to start making Ringo available wherever there is high demand. What is a Ringo Number? A Ringo Number is a custom local phone number that we provide you on sign up. You give it to your building or property manager at the end of the sign up process and it will tie your intercom to Ringo’s services.